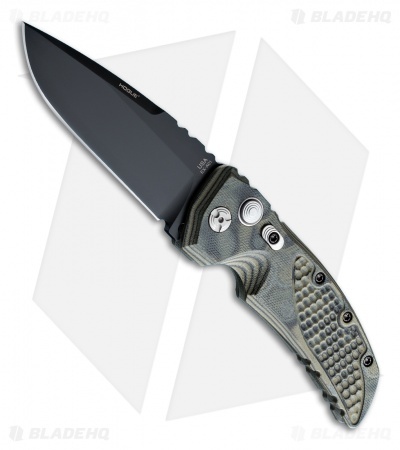 Hogue Knives' EX01 Tactical Folder from their Extreme Series is now available as an automatic opening knife. The action is smooth and lockup tight via the button lock mechanism. There is also a front mounted safety to lock the blade. The green G-10 handle features a pattern the creators call "G-mascus" (G-10 & Damascus). The front of the handle has piranha texture for a better grip. 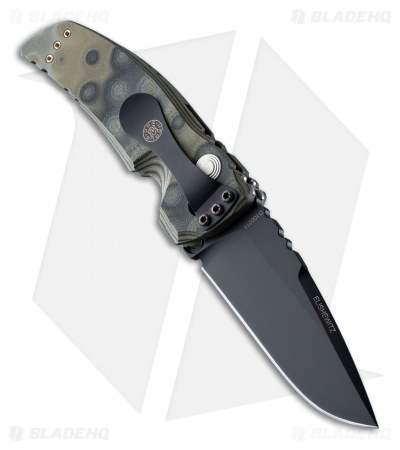 The drop point style 154-CM tactical black finished blade has a razor sharp plain edge. For easy carry there is a large reversible pocket clip for tip-down or up carry. Hogue, well known for the gun grips, has ventured into the knife world with the introduction of the Extreme Series, designed by Allen Elishewitz. The knives look good, they are comfortable and the function and action is beyond reproach. Be sure to view our other Hogue Knives in stock! I’m going to just say this knife has impressed me. I was skeptical. But I was proven wrong. Very well made. The scales are very well done. If you’ve ever owned Hogue G10 grips on a pistol then this is what you’re getting. Spring is very strong when blade is deployed. Lock up is tight. Fit and finish is fantastic. I’ll be getting others from their line. Great job! Also kudos to Blade HQ! They got it to me super quick. Thank you!